Usher Femme by Usher Eau de Parfum - 3.4 fl. oz. 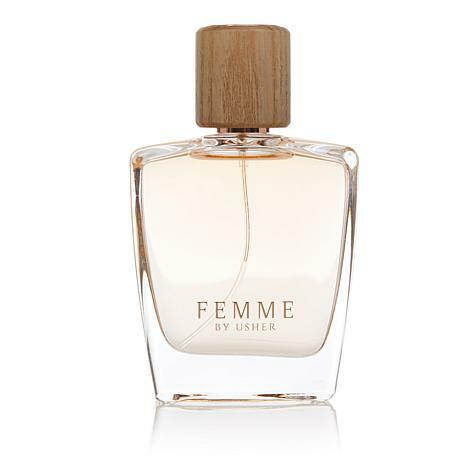 This new women's fragrance by Usher is a beautiful blend of addictive florals and woods for a modern and feminine fragrance. Ingredients: Alcohol Denat., Fragrance (Parfum), Water (Aqua), Ethylhexyl Methoxycinnamate, Butyl Methoxydibenzoylmethane, Ethylhexyl Salicylate, Linalool, Limonene, Butylphenyl Methylpropional, Hydroxyisohexyl-3-Cyclohexene Carboxaldehyde, Geraniol, Hydroxycitronellal, Hexyl Cinnamal, Cinnamyl Alcohol, Citronellol, Citral, Yellow 5 (19140), Blue 1 (CI 42090), Red 4 (CI 14700).